15 Anthony Watson (Bath Rugby 31 caps), 14 Jonny May (Leicester Tigers 32 caps), 13 Ben Te’o (Worcester Warriors 11 caps), 12 Owen Farrell (Saracens 56 caps) C, 11 Elliot Daly (Wasps 16 caps), 10 George Ford (Leicester Tigers 43 caps), 9 Danny Care (Harlequins 79 caps), 1 Mako Vunipola (Saracens 47 caps) VC, 2 Jamie George (Saracens 23 caps), 3 Dan Cole (Leicester Tigers 80 caps), 4 Joe Launchbury (Wasps 50 caps), 5 Maro Itoje (Saracens 17 caps), 6 Courtney Lawes (Northampton Saints 64 caps), 7 Chris Robshaw (Harlequins 62 caps), 8 Nathan Hughes (Wasps 13 caps). 16 Luke Cowan-Dickie (Exeter Chiefs 4 caps), 17 Joe Marler (Harlequins 54 caps), 18 Kyle Sinckler (Harlequins 8 caps), 19 James Haskell (Wasps 75 caps), 20 Sam Simmonds (Exeter Chiefs 5 caps), 21 Richard Wigglesworth (Saracens 29 caps), 22 Jonathan Joseph (Bath Rugby 38 caps), 23 Mike Brown (Harlequins 67 caps). Fully expect to see a tight game in poor weather conditions. Must see a reaction from England at all costs, we've been treading water since the tour down-under imho and have seen little or no improvement since, plenty of depth but they must start playing like they own the shirt. beshocked wrote: Londontiger I agree there's more to a leader than just what I said. Winning isn't just down to the captain. England should aspire for more. no 7 & 1/2 entitled to your opinion. I feel that you and other fans are fixated with the victories England have had with Hartley as captain. The performances have not been stellar in every game. If Farrell brings the passion, someone needs to bring the intelligence and brains to the field. eirebilly wrote: I have always thought that Dan Cole could make a good captain for England, think he has a great understanding of the game and always seems to be able to motivate the rest of the team. I know he is coming to the end of his international career but still think that he could have made a good captain. Probably too quiet for the Twitter generation (though as one of the few England players not on social media he would not know). He is a quiet, unassuming player who leads by example rather than rhetoric or chest thumping. Not really captaincy material, but certainly the sort of player whose presence encourages others to be better. Wins are certainly part of it beshocked but not the be all and end all. More bothered about his decisions and communication whoch have both been very good. Even added that communication could have been better last game though. Now that the "deities" have been dropped, who are the new "deities" and have they stolen the compromising pictures of ~Eddie, Borthwick and Gustard that were in the possession of Captain Hartley and Sergeant Brown? Always had the impression that Cole is a pretty smart cookie, and probably does his job on and off the pitch without the need for too much external motivation. Leicester fans will have more insight, but I've never been quite as confident about him since the year out with the neck injury. He seemed to be running on vapours by the time it happened, and he never quite got the same level of destructive scrummaging or breakdown work back after. I really can't tell if some of this stuff about Dank Hole is sarcasm..
Cole is world class on his day. Not had chance to look at the website recently, what is the general consensus on Lawes at six? Can't say I was all that happy about it when I saw it announced again this morning. The back-row continues to look unbalanced and slow to me. So the Lawes at 6 cr@p still continues. I expect a MASSIVE game from this back row...they owe one. Especially Lawes and Hughes. Brown dropped...yeah its been coming but im not sure Watson is the FB elect. His defence is woeful. Daly might move there. GeordieFalcon wrote: So the Lawes at 6 cr@p still continues. Oh, I dont know... He seems to be able to use Jedi mind tricks against TMOs..
Watson does ok for Bath at FB. 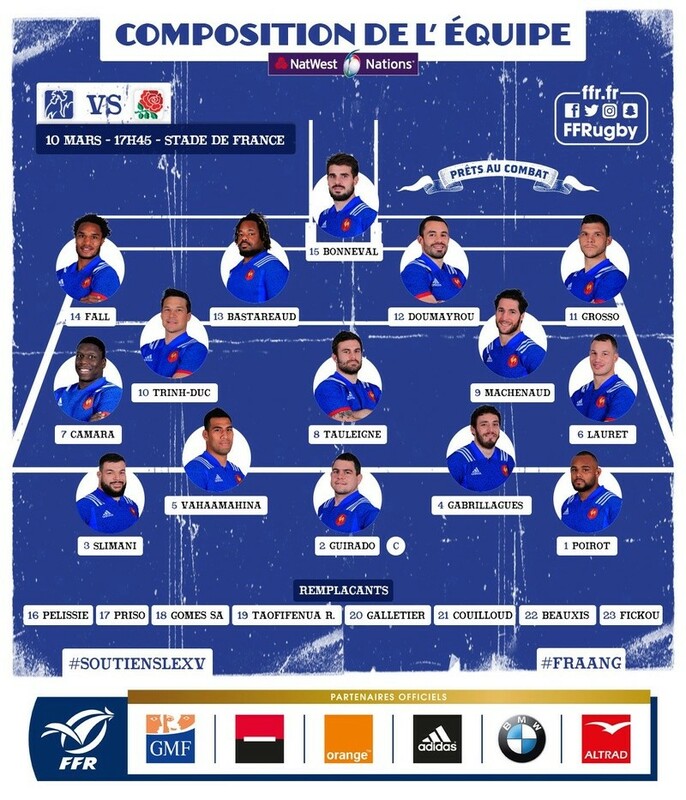 Lest face it this French team is poor and would struggle to beat London Irish. My issue with Watson at FB is not his tackling - which is indeed poor - as FBs so rarely have to make tackles. When they do often of the cover variety at which he is usually quite good. My issue is his positioning and apparent fallibility when fielding high balls. TightHEAD wrote: Watson does ok for Bath at FB. Well so far this season London Irish have beaten Quins. Quins have beaten Wasps twice. Wasps, so a regular postyer tells us, would beat England. So pretty much a guaranteed win for France. If England lose to this France team I'd happily take Lancaster back. Interesting that Jones has selected Mako as vice captain, which effectively makes him pack leader. Robshaw, Itoje and Launchbury would have been other options. Farrell will probably play the full match but Mako will go off. Wonder who is next in line in the forwards. Head spinning, swearing and being sick ? Mako has been putting in some serious shifts for a prop, playing over 70 minutes in the first two games. Probably won't be as necessary with Marler on the bench, but Eddie could keep him on for the duration. To be fair it was kind of funny and probably not far from the reality as well! Hartley travels with the squad anyway. You'd have to think eddie values his leadership. Slightly concerned about Watson in the wet weather. And the backrow still looks iffy. If we win but it's a real Poopie job, are we just papering over these cracks, or do we think Eddie will make more changes for Ireland? A very big pack that has to dominate what appear to be awful conditions. Very slow BR and surely regardless of the weather, we will struggle to link and exploit opportunities. Captain should be either Itoje or Launchbury. My money is on Itoje longer term. Mark my words on that! What use is Brown from the bench? Slade should cover FB, 10, 12 & 13. JJ 13 and wings, with Robson on for Care. Robson's non selection is plain stupid and arrogant..... Ony 2 SH's Bite's EJ's backside. Will Farrell (Blades of Glory) be carded? There's a good chance. Ultimately will we win? We should and I think we will, however with the terrible BR selection and Farrell's penchant for uncontrolled kicking when ball in hand is required......yes this could be another horrible loss, It's a real possibility. Basically its down to the fatties. If the 8 men stand up then we will win, hopefully good ugly not bad ugly and certainly not an ugly ugly loss! Latest weather forecast shows an improvement, sunshine showers fingers crossed. Launchbury is easily your best lock. Itoje is a show pony compared to him. England scrum wasn't great against Scotland, France could put you under pressure if they get the ref on their side. Their lineout is also looking strong: two big and athletic locks plus Camara in the back row make a good offensive and defensive unit. The breakdown, as ever , will be crucial. First half against Scotland the French did well with the ball on the floor. It was only in the second half as they tired that Scotland got on top. If France get ahead in the first half it could a close game. Basteraud should ask a few questions defensively of England if the French can win quick ball. He still carries too much weight but is definitely in better shape this season compared with previous years. Brunel missed a trick in not bringing back Lamerat after the Embro night club incident. Having a charged up Farrell trying to avoid being smashed by Lamerat could certainly have put him off his game a la Wilson and the tunnel incident. Eddie Jones as all ways picked what he considers is the best players for each game. I am a bit concerned that he as picked the same back row that played against Scotland though. England was truly out played and out thought in the Scotland game, so i do hope he as done some good thinking about that before he picked the current team to face France. It used to be said which France team will turn up depends on how good the game will be. France are starting to become very (unpredictable) in the style of play. But England are starting to become ( predictable) in there style of play. I do think it will be a tough game against France, and will be too close to call. England since ED took over have all ways found away to win, lets hope the Scotland game was just a blip in this years 6ns and England can find the way to win and win well, to secure a third 6ns title. munkian wrote: Launchbury is easily your best lock. Itoje is a show pony compared to him. Actually think on top form they would be the best combo. Itoje is our strongest scrummager, but on form he offers the athletic lock type of stuff, the tackling around the fringes, breakdown ability and the range to get out wide. He can also call and jump anywhere in the lineout. Launchbury is the heavy carrier and tackler. Eddie calling Tring-Duc the young boy in the presser was a bit of a strange one. sensisball wrote: England scrum wasn't great against Scotland, France could put you under pressure if they get the ref on their side. The ref is Jaco Peyper, so I don't see much of anything going France's way. Can't see him being impressed with our back row though. It might be just perception but I always think that France have one good performance in them. I have been watching them in tournament and I'm getting increasingly worried because it hasn't happened yet! Cumbrian wrote: It might be just perception but I always think that France have one good performance in them. I have been watching them in tournament and I'm getting increasingly worried because it hasn't happened yet! They arent as bad this year as many make out. I think they are still a bit disorganised tactically and lack confidence but they have very good players and a decent coach. Their defense has been the strongest in the tournament so far so a BP will be hard to come by. They are also quite good at the breakdown in particular Camara so England's key guys like Itoje and Robshaw will need to improve a lot. Their big weakness IMO is decision making, they seem to lack the confidence or organisation to do the right things at the right time. Sam underhill will be a big loss to England IMO. He looked like he was about to break into the side especially because England's backrow hasnt been great. They will offload a lot. If it comes off we will be scrambling. In that sense rain will help us. However we're actually a very very good team. They'll be worrying about us more. France might raise their game, but it's been a long time since they put in one of their once-trademarked "unplayable" performances, which is possibly where the one good game perception comes from. Despite Basteraud's performance against Italy, I don't fear their attack at all. They may make things difficult for us at scrum or breakdown, but I don't see them getting that many points against us unless the game really opens up. I know we're away, but I'd be genuinely surprised if we lost this one. If we can defend 3 phases of play, they will knock on. On the face of it they have a prop in the centres and have dropped their most exciting wing, Terry Thomas, for being a cad and a bounder. Yes but being disorganised tactically can be exploited if France bring that part of their game on Saturday. Scotland played out of their skins vs England - they raised their game. Will the French do the same? We'll see. I said before England vs Scotland - Scotland would have to cut the error count down - they did all that. Finn Russell had one of his best games I've seen him have in a Scotland shirt. France will need to be very accurate. England didn't quite get the rub of the green vs Scotland with 2 tries being disallowed. Might be different vs France. It could be a high scoring game with England chasing the bonus point and France potentially looking to play fast and loose. We played dreadfully away from home against a highly motivated and generally superb display from Scotland. We also suffered from exactly the kind of marginal 'rub of the green' type decisions that everybody who plays us at Twickenham complains about. And we could have won. We did not deserve to, but given how easy Farrell's try did look it was crazy we did not manufacture more chances. We are still a good team. We are due a good performance. We should beat France. OMG he is the worst ref on the circuit. The odds of England losing have just massively increased as far as I am concerned. The guy is useless. You won't have noticed but I'm really disappointed that the game will now be another incoherent inconsistent dogs dinner. I reckon this is a 50/50 game due to England selection. While I agree with your point, I have to admit that I am slightly surprised by the apparent shock at Scotland's win. Scotland were good enough to beat Ireland the last time they played them at Murrayfield, good enough to give Australia a thorough spanking - and even New Zealand only got away with a win because they are so good at riding their luck... Scotland are a good side, and with all due credit to them Murrayfield is a tough place to get a win now. I was disappointed with the manner England played and the margin of defeat (and despite their paucity it wasn't that big a margin - it's not like it was a 40 pointer ), but I thought it was the game they were most likely to lose before the tournament - and nothing has really changed. France and Ireland are both good enough to beat England if things go their way, but England are still marginal favourites for both games for me (based on my assumption that the Scotland game will have motivated them and got them refocused and back to top form). On another note - I thought Serge Betsen would have learnt better than to mock an England back row. I can remember him doing that once before, and as I recall it back-fired pretty badly. Basteraud can also be made to look like the fat prop he is, and fat props in back lines tend to leave holes. If we can take the right lines they can be exploited, and we do have a very fast back 3.